Room size: Irregularly shaped 9.5 x 9.5m open floor plan combines the living/listening room, kitchen and office. Added to this space the speakers see the air volume of the entry hall and a long corridor plus the 2nd-storey 6 x 9.5m loft. Wood-panel ceiling slopes up to the loft. Parquet flooring. Lots of non-parallel surfaces ('vertical gable' windows, twin-angle ceiling, spiral staircase enclosure, fireplace enclosure). For a pictorial tour, see here. Since auris is Latin for ear but also an ablative form of aurum which means gold, could Auris Audio stand for Golden Ear audio? 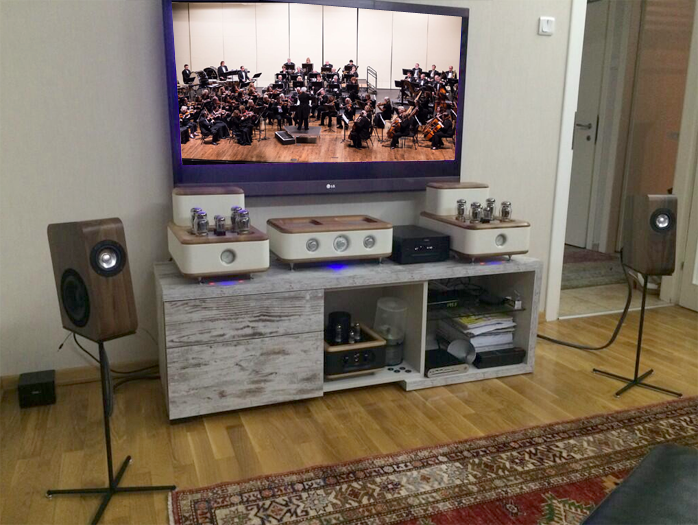 No matter, the system which opened my HighEnd 2014 show report combined Auris Audio valve kit from Serbia with compact all-wood speakers from Switzerland's Boenicke Audio. After everything I saw and heard over my three days of attendance, theirs was one of my favorite rooms. This was for sound, price and live-with-ability. The latter thinks of the normal living rooms most of us hifi nutters convert into sound rooms. The oft barely tolerated side effects are eye sores at best. At worst they devolve into very lonely under-decorated man caves. Not so with this kit. 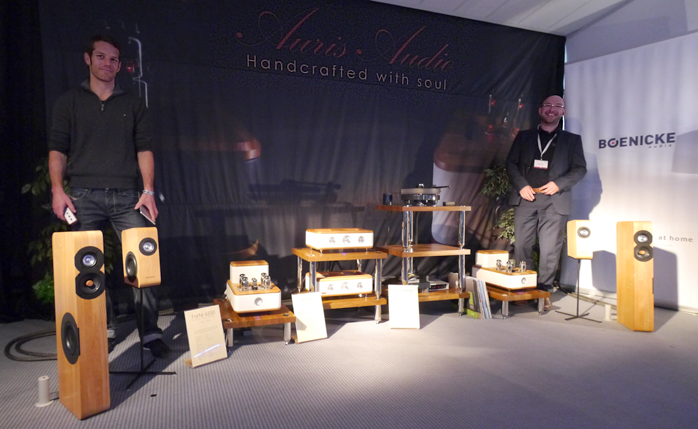 What's more, I also picked Auris Audio as my most significant new brand entry of the event. Whilst they'd shown a year earlier to preview promise, by 2014 they had full production cosmetics and a plethora of mature models. They'd taken the pulse in 2013, then committed to launch a hifi company out of Trstenik by the Zapadna Morava river*. During the show the Balkans had experienced one of the worst floods in centuries. Luckily Auris Audio returned to Serbia with a factory that had (just) escaped the rising tides. * As the Wikipedia tell us, "...located in central Serbia 205km from Belgrade, Trstenik lies at the intersection of the Morava roads which connect this region to Kruševac, Kraljevo, Vrnjačka Banja, Župa and Levča." One glance at the photo below shows tides of a different sort. 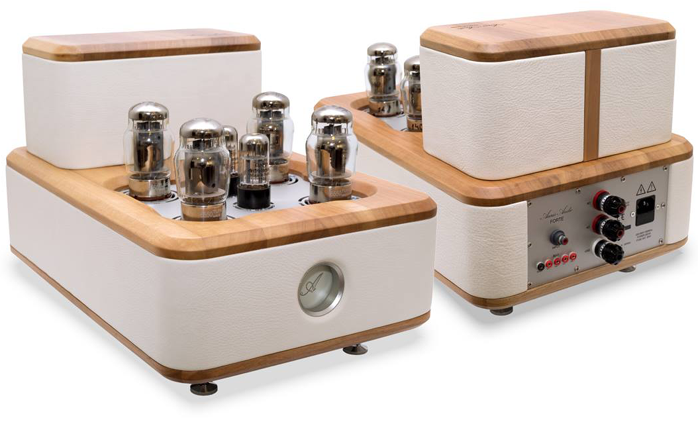 Sven Boenicke at left and Milomir 'Miki' Trosic at right look over stumpy speakers not even reaching their Swiss designer's belt; and elegant valve gear wrapped in cream-coloured leather topped with solid Walnut planks in a nod at Kerem Küçükasian's Absolare cosmetics [right]. Their room-filling sound had many look for a hidden sub. Not so. Milomir's 100-watt quad 6550 push/pull monos played the puny W5se stand-mounts without any need for a separate bass box. Even hard-boiled show veterans like StereoTimes' Clement Perry were taken by surprise; and went on to say so in print. Less can be more. More to the point, less is often simply enough. Here that was key. Many exhibits concentrated on very big expensive speakers fronted by ultra electronics. Few would bring those home. The Auris/Boenicke room was about RealFi. That statement naturally carries a proviso. What goes for realistic amongst committed audiophilanderers remains far too costly for civilians who enjoy playback without much concern over fidelity or the equipment involved. But in high-end terms, this room did play it relatively modest and shone all the more for it. To document why I singled out Auris Audio for most impressive new company, consider the serious stack of gear below. None of it existed a year ago. All of it was on display in Munich this year. 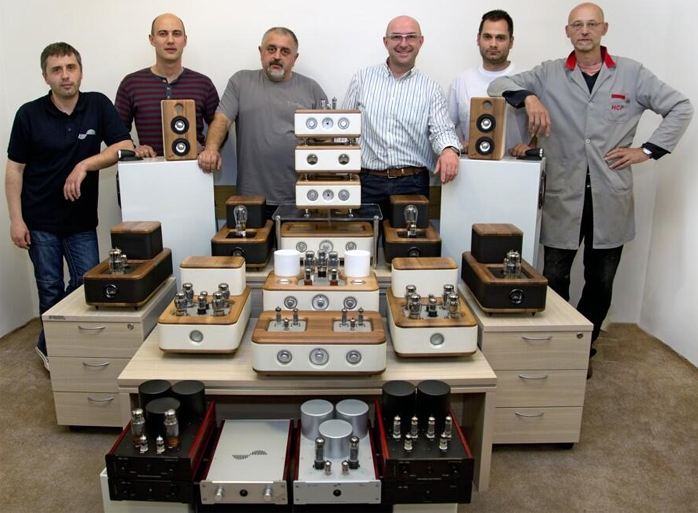 Third from the left is Slobodan Šošić, lead engineer for Auris Audio. At his right is Milomir Trosic, CEO of Auris Audio. The group photo suggests resourcefulness and industry of a sort not expected from newcomers and perhaps even less so coming from Serbia. The country is surrounded by EU nations yet as a non member remains economically and politically isolated. Not like for Switzerland, this creates setbacks for commercial infrastructures. 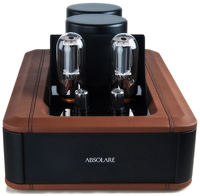 Trafomatic Audio of course have already demonstrated Serbian can-do in the pursuit of value-oriented valve gear. It once had boss Sasa Cokic joke that if he lived and worked out of Germany or Switzerland, they'd be a mainstream brand by now. Serbia also is home to NAT Audio Design, Karan Acoustics and the very well-liked Raal Ribbons whilst Fiat's factory at Kragujevac builds the Model 500 Italian mini cooper. Auris & Boenicke in casa Miki. 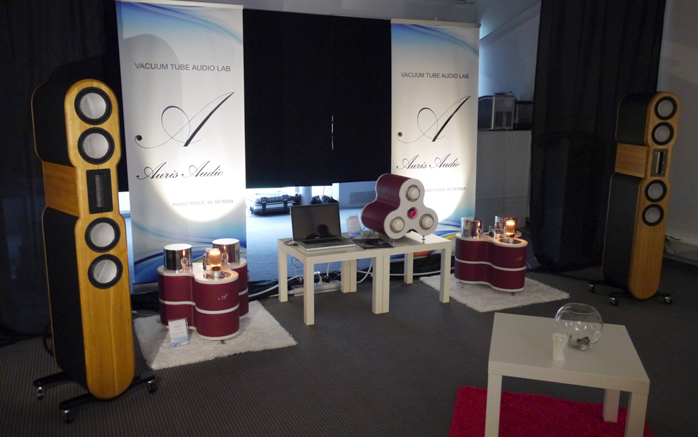 Miki visited Switzerland on August 11th to talk about his plans for Auris Audio and what's behind his company. 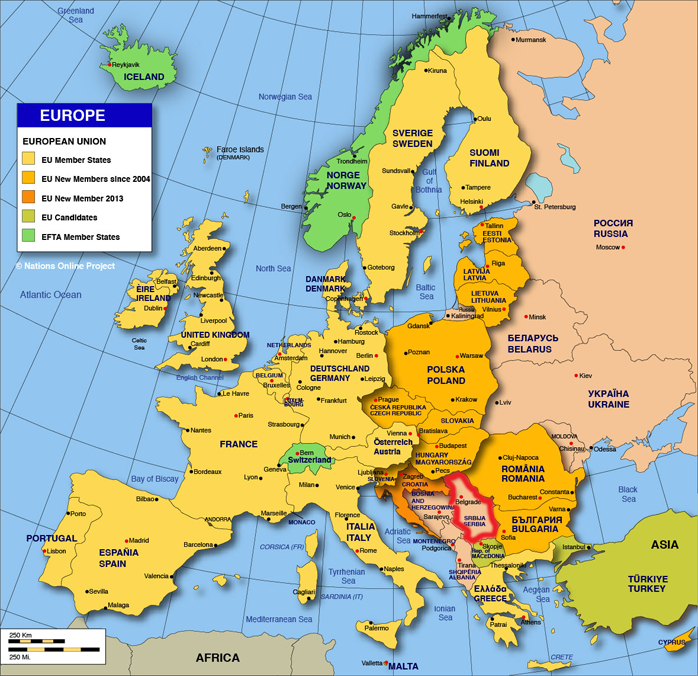 As this map shows, Serbia, Bosnia, Herzegovina and Albania form a non-EU island surrounded by EU nations.